Scottish mezzo soprano, Taylor Wilson, studied voice at the Royal Conservatoire of Scotland and it was there that she developed an interest in contemporary music and worked closely with the composer Judith Weir. She then read modern languages at Strathclyde University (French, German, Italian) and, with support from the Sir James Caird Travelling Scholarship, she pursued postgraduate studies in opera at the Royal Northern College of Music in Manchester. Later in her career, while performing in Germany, she explored avant-garde music and drama in Berlin and music theatre in Hamburg. Since leaving college, Taylor has championed contemporary music, and to this day she enjoys the collaborative process of working with composers and performing works which are written for her voice. Operatic contemporary roles she has created include: Lady Brannoch in Madame X and Silent Jack, a one-woman opera, both composed by Tim Benjamin, which featured at London’s Tête-à-Tête Festival, to critical acclaim and ‘Spitfire’ Irene in Flightpaths by Stephen Kilpatrick, written for the Cultural Olympiad. (For information on classical roles, see Classical). On the concert platform she has been soloist in; In the beginning (Copland), Pribaoutki and Les Noces (Stravinsky), Schöpfer Geist (Körpper) in Hannover with NDR Radio Orchestra, and Pierrot Lunaire (extracts, Schönberg). She collaborated with James Macmillan on his piece, Raising Sparks, for mezzo-soprano and ensemble, as part of his fiftieth birthday celebrations. As founder member of Scottish Voices, an all-female ensemble, they regularly record and perform new works. Taylor was privileged to be recently involved in the BBC’s commemorations of the events of World War One, performing a work by Dr Stephen Davismoon to mark the centenary of the commencement of the Battle of the Somme. 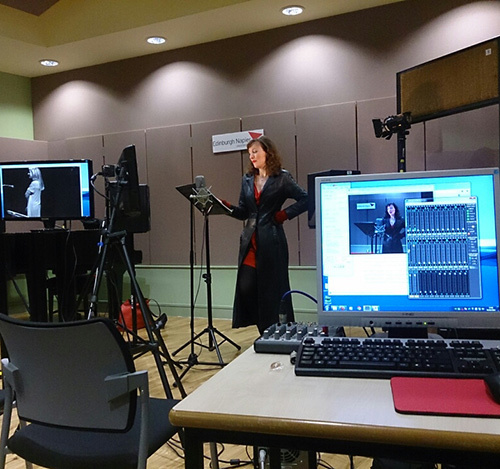 “God’s Own Caught In No Man’s Land” had its world premiere with the BBC Philharmonic, a contemporary oratorio, scored for full orchestra, chamber choir, mezzo soprano and narrator, recorded Radio 3. Contemporary music recitals include the Edinburgh Fringe, Glasgow University, a Dutch radio performance in Hertogenbosch, Holland and a concert tour of ‘Fearful Tales’, with Canto per Tre, a song-cycle which was written for her by award-winning composer, John McLeod, OBE. She has a successful collaboration with contemporary pianist, Lauryna Sableviciute and recently they performed together in recital as part of the BBC Philharmonic Peel Hall series. Taylor enjoyed immensely the opportunity to perform two live streaming concerts with Lauryna as part of the Sonic Fusion Festival, using the latest online streaming technology. The two artists were linked up, where Taylor performed from Edinburgh Napier University and Lauryna accompanied her at Salford University’s Digital Performance Lab. Off the concert platform, Taylor has made several recordings of works composed for her, by John Rose and John McLeod. Her latest recording, (Life Stories), features the one-woman opera, Silent Jack, by Tim Benjamin, a role created by Taylor and which has received much critical acclaim. She has made several CD recordings with Scottish Voices and has appeared on a number of soundtracks for both film and television, (featuring on the sound track of a Scottish-based film, Blinded, by composer Malcolm Lindsay, which was screened at the Edinburgh and Cannes Film Festivals).